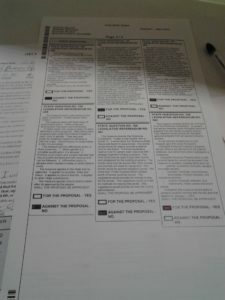 Next, I went to get to the part where I filled out the information that they would use to verify who I am. Two issues with this. First, I refused to show my ID but was told I had to provide a drivers license number. Why is that necessary? What if someone who does not have a drivers license? How are they going to provide that information? I was pretty sure that they didn’t need that information, but decided to relent just to not be too difficult. The next problem came when she asked for my political affiliation. When she asked, she asked if I was Democrat or Republican. Those were the only options she listed in the question. I responded that I am Americans Elect until tomorrow. She looked at me like I was an idiot or a liar. She then asked me if I was even in the book of registered voters. I said yes. She asked me again. I told her again and she finally wrote it down. I then recommended that she change the way she asked the question of affiliation to include Independent. This is where it got really interesting. She told me right off, that there are no Independents. I told her that 11% of the registered voters are registered as Independent. She told me “They don’t come here.” She then lectured me on why people end up as Independent. She claimed that those who are registered Independent are people who simply forgot to declare Democratic or Republican when they registered. She was one of the most ignorant persons I have ever met. So, As for voting, I finally got mine cast, provisionally at least. I skipped the Presidential line. No sense voting for evil no matter how “lesser” it is. 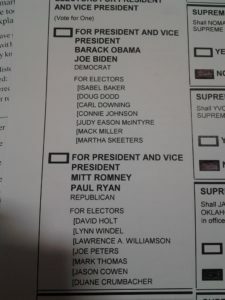 Voted for Democrats in State House and Senate because I just didn’t care for the Republicans. Voted for Hewitt for McClain County Sheriff. 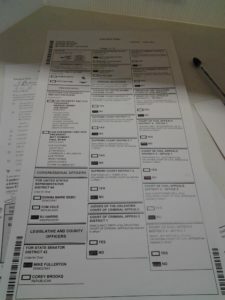 Here are some images of my ballots, which by showing you, I am breaking the law. Oops. Click to view the full size.